Senior Kaeli Thompson (Warwick Valley) was once again over the High Bar this weekend, taking home the meet record at the New Balance Games with another 13-0 clearance. It came one week after she nabbed a new lifetime best, clearing a NY #5 All-Time mark of 13-3.5 in at the Stanner Games. Thompson has established herself as one of New York's best ever, even amongst her own elite training group. Warwick Valley has long been thought of as the New York State hub for Pole Vaulting. Athletes travel from all over the Tri-State to be a part of the Hudson Valley Flying Circus Pole Vault Club. Practicing out of "The Barn," a literal barn converted into an Elite Training Facility, with dual runways, and numerous training aparatus, the Club is home to State and National Champions alike. Thompson is among them, but unlike many of her training partners, she calls the town of Warwick home. The club is run by Coaches Tim St. Lawrence and Hugh Cauthers, recently adding Barn Alum Stephanie Duffy to the coaching mix. 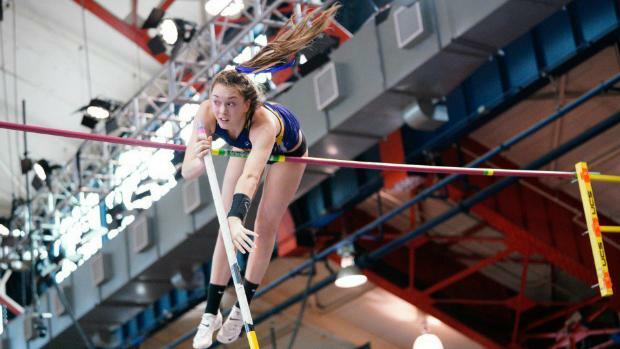 The duo both were head coaches in their time in Section 9, Saint at Warwick and Cauthers at Monroe-Woodbury, while Duffy was NY State Champion for Washingtonville, before moving to become a standout Vaulter at Duke. Both have garnered name recognition from their Coaching Career, amplified even moreso upon their retirement from Head Coaching, to dedicate their time to "The Barn,". Likewise, Thompson has found her own celebrity-status, now the top ranked Vaulter in School History. "Growing up in a community like Warwick has been amazing," says Kaeli. "Because track and field is a tradition in Warwick, teachers and peers at school wish me well and congratulate me, which means a lot." Kaeli fought through a competitive Junior year last season trying to reach and overcome that 13-0 mark in Pole Vault. Her training was validated at West Point last winter, when she first cleared the mark to win the Section 9 State Qualifier. She followed that up with a 3rd place finish at States, and a 5th place finish at Indoor Nationals. She has her sights set on another repeat appearance at the Indoor State Championships with hopefully another huge mark. While Pole Vault has become her best event, she has continued to post some very good marks in other jumping and running events. She has set PR's of 36-1 in triple jump, 9.11 in the 55 Hurdles, and 16-2.5 in the Long jump. 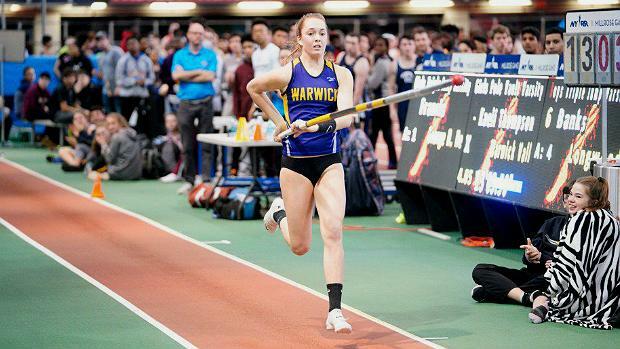 "Kaeli is a team first athlete," adds Coach Mike Potter (Head Coach of the Warwick Valley HS Boys & Girls Track teams) "She is always doing other events to help out the team and does whatever she's asked by her coaches, from the 4X4 to the triple jump, hurdles and beyond." Her senior year has been less stressful now that pressure of clearing 13-0 for the first time is behind her. She is feeling more confident this year after a really good summer. and fall training session; "Knowing I've done the work to get there gives me a lot of confidence when I step on the runway,". "Her greatest strengths in my eyes are her grit, determination and discipline," says Coach Potter. "Kaeli puts in countless hours of practice time between track practice for vaulting sessions and strength & conditioning. She makes it all work. Kaeli is super bright, (currently ranked 10th in her class academically) super driven, and has made all the right moves in getting herself to this level," says Coach Potter. As far as Kaeli's goals for this season; "I'm really just looking to go as high as I can this year, and to place well at States, Nationals and other competitive meets. I know that I have more in me and I'm so excited to see what the rest of the season holds." Kaeli has committed to Duke University for next fall to continue her Academic and Athletic career. "She is making our community very proud. She is a product of her parents Greg and Heather, who have been nothing short of supremely supportive of her and her team," says Coach Potter. When asked what inspires her both on and off the track she very easily answered, "I look up to Coach St. a lot, I mean I don't really know anyone who knows him that doesn't." Some of her Vaulting idols include Sandi Morris, Eliza McCartney and "definitely Mondo Duplantis!" Off the track, it's her parents and her sister who provide the needed inspiration to keep working. Coach Potter followed suit with a special tip of the hat to Coach Saint as well. He knows the value kids extract from Saint's tutelage, as Potter himself is a product of that coaching. Potter is a Warwick Graduate himself, and ran for Coach Saint throughout his HS Career. "You see it all the time with clubs and schools not meshing together, but hats off to Coach St. Lawrence and the Flying Circus. Coach St. comes from the high school circuit of coaching athletes, where he was a coach in the school for 35 years (even as my HS coach). I want to thank Coach St. for being so supportive of the high school programs first and foremost. There are many positive lessons being taught each day at the "Barn" and they are not all about Pole Vault. He's the best." When asked what it is like to coach Kaeli, Coach Saint responded; "Every 30 years a special athlete like Kaeli arrives to elevate our sport in terms of spirit, leadership and sportsmanship. I must say it's been a blessing for me to be able to help Kaeli with her dreams of becoming all that she can be. She has been a true inspiration and model for all of our athletes here at Warwick Valley."